A Beijing-based hotel developer is hoping to strike the jackpot in China's tropical southern island of Hainan. 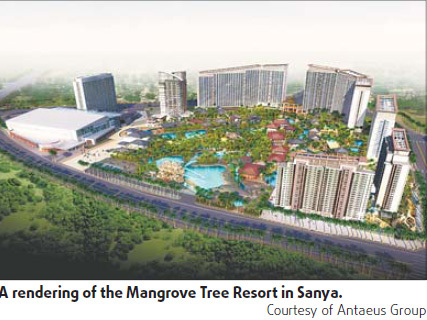 The Mangrove Tree Resort, under construction on the island's coastal city of Sanya, will become the biggest hotel in Asia, said Zhang Baoquan, chairman of Beijing-based developer Antaeus Group. The group is hoping that the resort, covering 700,000 sq m, will be the country's first lottery and gaming-themed hotel. The hotel will have a 30,000-sq m gaming area to house a greyhound-racing stadium, sporting events and go-cart racing, he said. Zhang acknowledged that they have changed the original design of the 9-billion-yuan project, which was started in 2009 and is expected to be finished by 2012, to add the gaming area to the hotel after the government unveiled its efforts to boost tourism on the island in early January. The government plan said Hainan will introduce international sporting and entertainment events, and explore ways to promote the local lottery industry to help make the island into an international tourist resort by 2020. Although Hainan officials have repeatedly said that it is impossible in the future to develop the gaming industry, Zhang said he still expects the policy to be relaxed one day. At present, the gaming area is being built to accommodate a possible casino down the line, such as higher roofs and underground pipes, Zhang said. "The investment will increase 20 percent after we modified our original design," he said. "But I still believe it is worth it since the cost would be much higher if we have to modify it after we complete construction." Hainan officials consider the hotel a hype. "The government hasn't noticed that the hotel has modified its design but clearly before providing any kind of lottery and gaming entertainment, the hotel must get official approval," said a local publicity official, who declined to be named, to China Daily. The developer is expected to sell the property rights of 5,600 guest rooms to the public. Sales will start after the Spring Festival. "The average price is about 27,000 yuan ($3,139) per sq meter and for a whole room, the price is between 1.5 million to 2 million yuan," said Sun Luxuan, chief planning inspector of Antaeus Group. The company is seemingly trying to ride the property boom on the island as real estate speculators have rushed to Hainan to purchase en masse, pushing local property prices skyrocketing and triggering fears about a housing bubble. Prices of some of the properties have already hit 70,000 yuan per sq m, with figures constantly fluctuating. Of the 700-odd officially published photo portraits of late Chairman Mao Zedong, more than 400 were taken by photographer Hou Bo.